Hurricane Harvey, which killed two people and devastated parts of Texas this weekend, was causing some hospitals to close or evacuate because of flooding and still-dangerous weather. Baylor College of Medicine and its clinics closed on Sunday, as did all Texas Children's Pediatrics practices and Texas Children's Urgent Care locations. The University of Texas MD Anderson Cancer Center's Houston locations would be closed Monday. 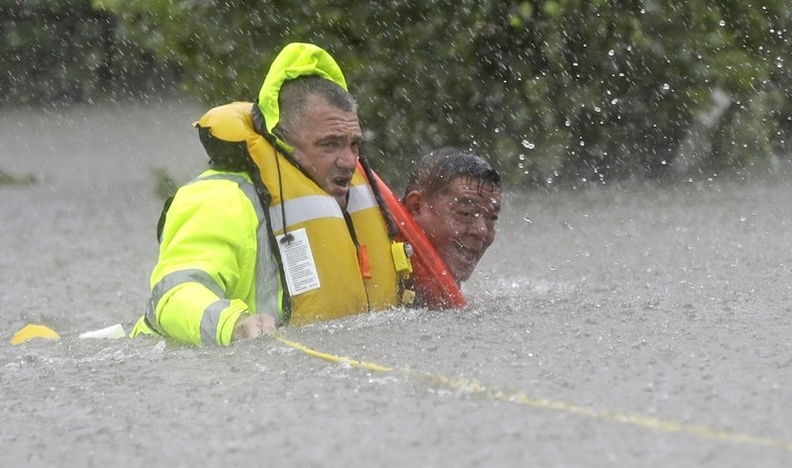 William F. McKeon, CEO of Texas Medical Center, Sunday afternoon tweeted that "the vast majority of critical care facilities are operating normally, but that many TMC access points are underwater, making access & mobility difficult." Late Sunday afternoon, the evacuation of Houston's main public hospital hadn't begun yet because it is surrounded by waist-deep water. Bryan McLeod, spokesman for Harris Health System, said Sunday that minor flooding in the basement of Ben Taub Hospital and a busted sewer pipe forced officials to close the kitchen. McLeod said the flooding resulted in only a small amount of water in the basement and did not affect the hospital's power supply. But shutting down the kitchen leaves the hospital with a limited supply of dry food for patients. McLeod said the evacuations wouldn't start until the water receded from around the facility and would likely take several days. The hospital is part of the Texas Medical Center and has 350 patients. Harris County Judge Ed Emmett Sunday said that Ben Taub Hospital, the county's public hospital, was being evacuated because flooding problems in the basement disrupted power service. Emmett oversees government operations in Harris County where Houston is located. He said evacuated patients were taken to other area hospitals. It was not immediately known how many patients were being moved. Officials in Dallas said they'd open the city's convention center to about 5,000 people who are fleeing from the hurricane-ravaged southern part of the state. Dallas has three shelters currently open for evacuees, but the convention center will serve as a "mega shelter." The city, Red Cross, Dallas County, Parkland Hospital, the Salvation Army, Children's Hospital and other volunteer groups are coordinating the logistics of getting the shelter ready. Accounting firm RSM US estimated the damages of Hurricane Harvey will ultimately exceed $40 billion, making it one of the costliest storms in recent U.S. history.